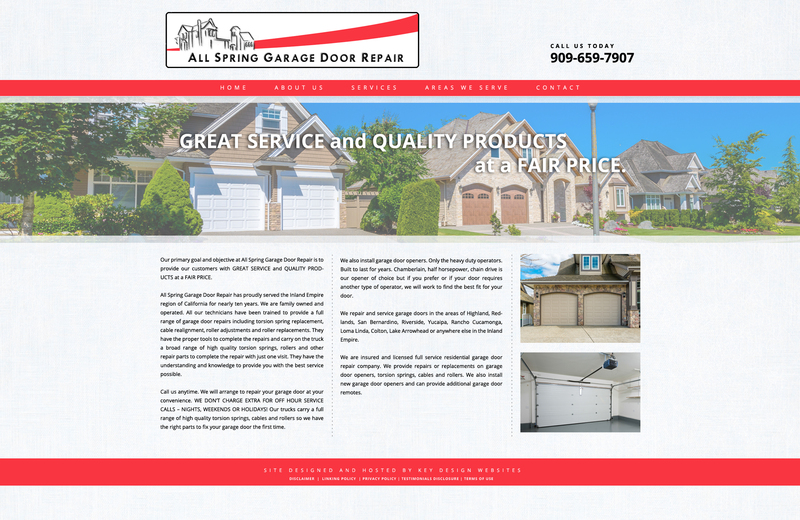 Our primary goal and objective at All Spring Garage Door Repair is to provide our customers with GREAT SERVICE and QUALITY PRODUCTS at a FAIR PRICE. All Spring Garage Door Repair has proudly served the Inland Empire region of California for nearly ten years. We are family owned and operated. All our technicians have been trained to provide a full range of garage door repairs including torsion spring replacement, cable realignment, roller adjustments and roller replacements. They have the proper tools to complete the repairs and carry on the truck a broad range of high quality torsion springs, rollers and other repair parts to complete the repair with just one visit. They have the understanding and knowledge to provide you with the best service possible.